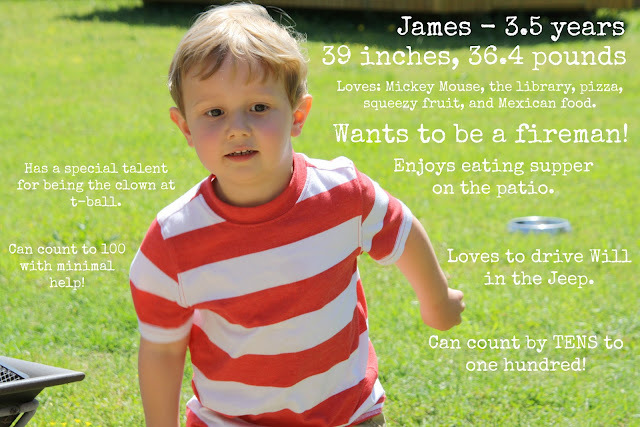 A Page Is Turned: James at Three-and-a-Half. This child. He definitely marches to the beat of his own drum and so far he could not care LESS what others think about that. He is fiercely independent but needs a buddy all the time. He is a bossypants. I have no idea where he gets it. He still isn't a good sleeper, but he NEEDS his sleep. He is stubborn, strong-willed, and charming. He has taught us a LOT - especially about patience! - and I wouldn't trade a minute of it for anything in the world.